What? You didn't know you gave me a gift? You did by coming here and reading this blog. You did by commenting to something I wrote, either to tell me a story of your own, to say that what I wrote made you laugh or cry, or to offer me encouragement during a tough time. You gave me an especially big gift in your comments to my last post. Thank you, thank you, thank you (a million times over) for those comments which made me cry and smile and feel glad that I ever started this blog. Merry f-ing Christmas, indeed. Keep an eye on those reindeer. OMG, I'm trying so hard not to laugh really loudly! The kids will come running and ask what I'm laughing about. More people should have such a sense of humor about the holidays. Love it! And it's so good to work more closely with you now at CMP. Hahhaa....that made me laugh so hard. One time we had a really uptight cranky set up neighbors that lived right between us and our fun neighbors. Mr and Mrs Cranky-Pious had put up some reindeer at Christmas and early, early one morning Mrs Fun called me and hissed into the phone. 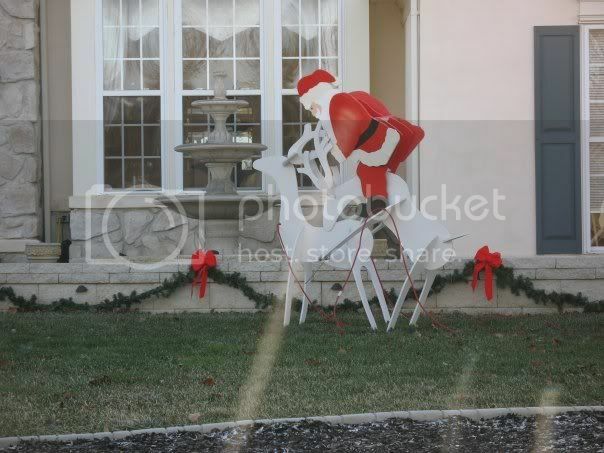 "look out kitchen window, the Cranky-Pious' reindeer are doing 69 on their front lawn." Heee-larious! Hope you had a merry! You mean people call the POLICE for stuff like this? Man. That's sad. This is the kind of relationship Jed and I have always hoped to cultivate with our neighbors. No way! Find those theives dammit and when you do, tell them I think they're hilarious. First off, I had nothing to do with your reindeer and those "compromising positions." However, just wanted to say whenever I drive by someone with reindeer in their yard I really want to sneak over and do the same thing. In fact, I just bought my own two reindeer and I'm thinking I'll just vandalize my own yard next year. Tears. I'm laughing so hard, I've got tears. I've always thought those light up reindeer were kinda frisky. Thanks for catching the photos! In need of some elves. . .
How do you know you are done?